Would you like our 10-day FREE Bible Journaling Course? Register Below! Enter your name and email to get your first course! This $97 value is yours FREE! If you have any problems seeing this form, you can click here to register on the hosted version. Lesson 10: Bonus* Shhhh…it’s a secret. *Bonuses include printable stickers in .pdf format. When Do I Get My First Course? You will receive an email after you sign up for this course. It includes the first course! You’ll receive the next class on the next day for ten days in a row. Please save the emails so you have access to the course at a later date. Since this is a free course, we can’t resend them to you. Sorry! If you don’t open the emails, your email system will think that you don’t want them. Please open them! Otherwise, your email provider will stop allowing our emails to get to you. We’re trying to send them, but your email provider will eventually block them if you don’t open them. We recommend that you take begin the course prior to buying supplies so that you don’t buy things you don’t want or need. A list of budget supplies and high-quality high-value supplies is provided in class #1. Why is This Bible Journaling Course Free? Everyone should have the opportunity to grow in the Word regardless of their location, schedule, or budget. Period. The content that is shared in this 10-day course is necessary to understand the basics and feel comfortable beginning the process of Bible journaling. This course answers almost all of the beginner questions that I have answered since starting this ministry. Will Future Courses Be Free? Future courses will have a small fee associated with them, but they’re not necessary courses. They will build upon this foundational course. We continue to share technique videos on our YouTube, which are free! We also give away a monthly freebie printable (valued at $4.99) to everyone who is on our email list. If you take this course, you’ll automatically be signed up for that freebie. Yay! Can I Share This Course? Yes. 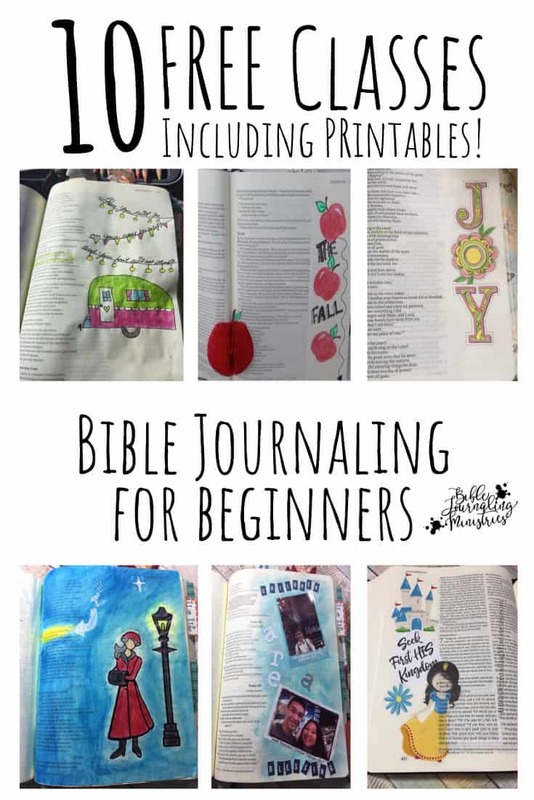 You can share this free Bible journaling course…but share this page only. Please don’t share any of the course pages or freebies that we mail you. It’s unfair to the person that you’re sending it to because they miss out on our special announcements and other freebies. Absolutely! Just click the “unsubscribe” link on any of our emails and you will give your seat up. You won’t receive any emails or get notifications from us including our monthly freebies. What Do I Need to Download the Files? You’ll need Adobe Acrobat Reader to download our free files. Most computers already have it installed. However, if yours does not, you can download it for free on their website. This is a wonderful gift to me. I have been “planning on” starting my journaling but am beyond lost in how to start, where to start, or what supplies I need. I’m so excited because now I feel like it’s possible due to this class and the fact that I am still dealing with what Hurricane Irma did to my job I wouldn’t be able to pay for the class. So thankyou and God Bless You! I simply ADORE this course! Such a fun, friendly way to learn some new techniques and perfect for me as a beginner! I am thrilled to find a course like this that wil give me information so I can better understand how to work with my bible. Thank you so much for this free course . I have taken a Bible Journaling class recently. Has been such a blessing for me. Am in the process of moving and after I get settled and have all my supplies organized, I would like to continue my journey through the Bible. It will be several months before I can return to the journal. Thank you for the freebies that I can save for later. Tried to sign up but will not let me submit. Hi Kim! Please send an email to support at Biblejournalingministries.com – We can get you signed up with your written permission. I have always been more a writer than an artist. In fact, I still use stick figures. However, I have a daughter (only 5 now) who seems to LOVE drawing, singing, dancing, and all things expressive. I had never heard of this technique before yesterday when I stumbled across the idea online. I believe this will be a lovely way for me to bridge the way my daughter and I will continue to talk about and relate to Scripture, and each other, as she grows. Thank you! What an amazing way to spend time with your daughter! I typed in the wrong email address. Can I resubmit. I can’t signup. The reCAPTCHA doesn’t show up entirely on either of my screens in order to find out what the question is and answer it. How do I proceed? Lonny can help you out. I received the first day’s introductory email on Friday, and watched the four videos included in that email. However, I haven’t received anything further, and today is Monday. I’m anxious to continue, and am hoping you can help!! Hey Barbara! I see that your emails are getting to you so I’m not sure if there is a specific question to answer. You can reply to the email I sent you if you have another question and we can help! Hi, My mom passed away yesterday. I am interested in Bible Journaling but just not right now. Kathy – I’m sorry for your loss. I cannot get the verification block to engage in order to sign up for the 10 day course. I signed up but never received the first email. I looked in my spam too. Not sure what to do now. Register again? I’m not showing you in our system Anne. Can you please try again? Thank you! I wish I had time to do this. We are leaving for a summer long motorcycle ride to alaska and back, but maybe when I get back. Can I take part in this? I live in Norwich, England. Will I have to purchase items from America, I have a journaling bible and a complete guide to journaling. I do not have a web-site, will this stop me taking part? Thank you SO much. Very helpful. Bought my journaling Bible this week. Can’t wait to start but I am so afraid to mess it up. These classes are SO inspiring. Thank you once again. I am anxious to start this course. Please send my first lesson today. Thank you for caring and offering this to all. Where do I sign up for the first class? Not seeing a place to do this, or did I miss out? The box to subscribe is under the video. It may take a few seconds to load. Really excited to start journaling God’s word. I love coloring and now want to take the plunge. Thank you for giving me the opportunity to begin. Thank you for your ministry and kindness. My budget is tight, and I’m trying to be a good steward of our Lords provisions. This sight is a God send. I’m going to the 10 day course you talked about. God Bless abundantly. I am excited to learn to focus more on God’s word. I have always “doodled” in my bibles and they get pretty messy after awhile. I am looking forward to do something that someone after me could see and make sense of it. Thank you.